Hello Loves! 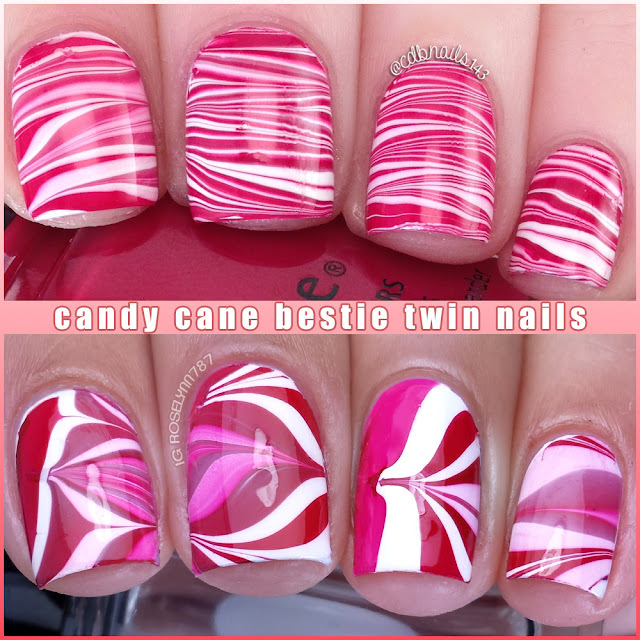 Today I have this months Watermarble Bestie Twin nails with Roselynn from www.manicuredandmarvelous.com to share with you! Every December since we've known each other we have done candy cane themed water marbles so of course this year wouldn't be any different! And Lucky for us one of this weeks prompts for 12 Days of Christmas Nail Art is "Candy Cane" so we killed two birds with one stone! Here is our results! And here is a close up! These turned out very nice. They also reminded me of how I haven't done a water marble design in so long! I love that you two did a water marble for this prompt, it's such a great way to create a cool look!